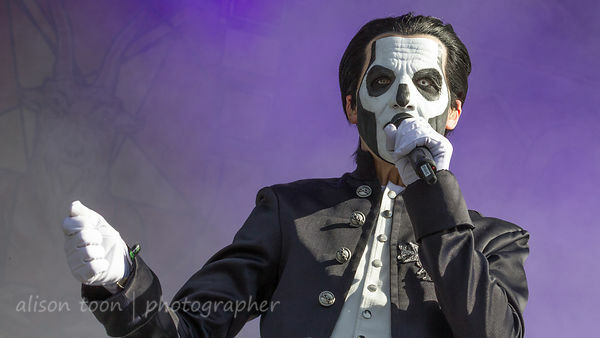 See the full Ghost photo gallery by clicking here! Also from Sweden (Avatar and Meshuggah too), Grammy winners for best metal performance 2016, Ghost , took the stage at this year's Aftershock festival in Sacramento's Discovery Park at just-after three in the afternoon, on Sunday, but not before treating us to several minutes of beautiful, ethereal, plainsong chant, which added to the you-should-be-in-church feel of the stage backdrops; paintings of stained-glass windows... except the windows didn't depict saints, they were a tad darker and subterranean and more fiery than that. 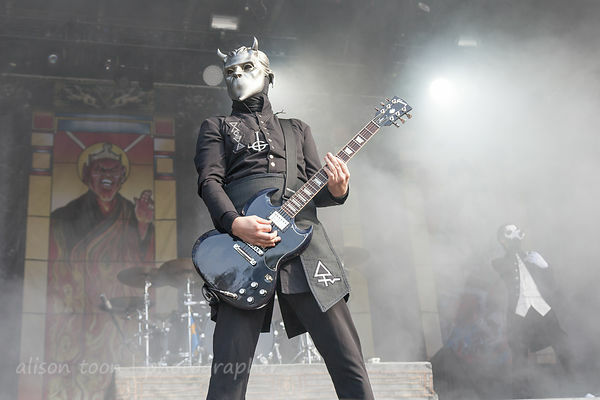 Blue-eyed Nameless Ghoul... but are those contacts??? With a catalog of music ranging from melodic-yet-heavy doom metal to more radio-friendly songs like the recent Square Hammer, Ghost are wonderfully entertaining, a visual treat, and really good music. A wonderful, devilish way to spend an October Sunday afternoon. The band members are Fire or Alpha (lead guitar), Water (bass), Earth (drummer), Wind (keyboards) and Ether or Omega (rhythm guitar). 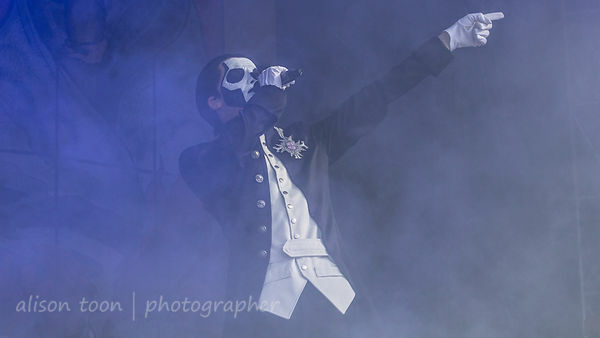 We think they must be magical, to breathe through those masks throughout an entire show... or maybe they are just Nameless Ghouls, and that's what Nameless Ghouls do. To read more about the stories, history and intrigue, see Wikipedia's Ghost page. 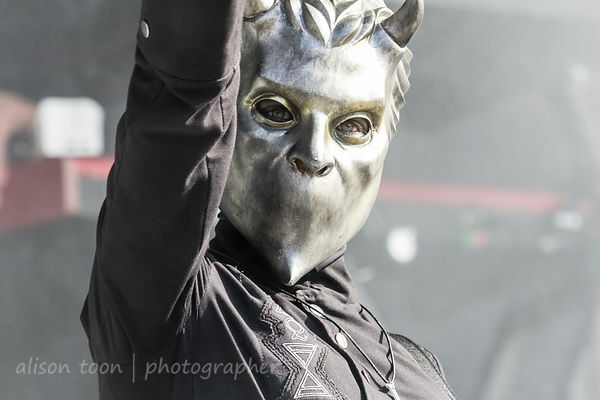 Many more photos in the Ghost photo gallery: click here! Find Ghost on their website, on Facebook, Twitter and Instagram. And check out their latest EP, Popestar! Catch them on tour if you can--they are here in the USA until mid-November.